Social media as a means of marketing is becoming powerful day by day. Twitter, a social media tool is becoming of the most important player in that area and is being increasingly used to market the product. However, marketing firms and companies find it harder to understand the return of investment (ROI) of their marketing campaign on social media website. Furthermore, as social media moves beyond its current states, means of marketing gets more and more complex. These companies particularly in current economic environment need to make sure their investment returns maximum value. This is where Rankmeme comes into play. 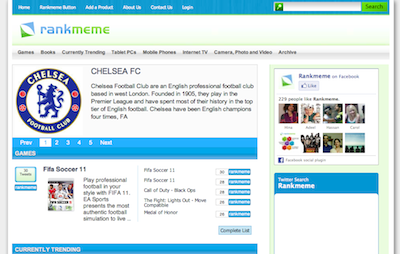 Rankmeme provides a platform to track the behaviour of products and recent events on Twitter. It has the capability to provide detail analytics including day-by-day popularity of a product. While ensuring the products are distinct thus creating that unique platform that no other service provides. Furthermore, Rankmeme social media plugin allows Rankmeme button to be integrated to other websites thus providing web owners an opportunity to increase the web traffic and back-links. In short, Rankmeme provides a win-win situation to everyone from consumers to manufacturers of product, from media firms to marketing firms, from bloggers to web developers or SEO expert!